Have you noticed how many romances start with the hero kidnapping the heroine? What's up with that? It's not my favorite trope, though not a deal breaker necessarily. I know it is for some people though. In this case she doesn't stay kidnapped for long. Once Tendra learns about the prophesy and her family connection to the vampire clan, she goes along with Athan's plan. 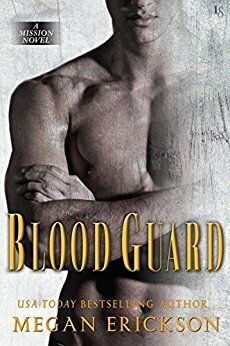 I love a road trip story, which is essentially what Blood Guard is, with Athan and Tendra travelling across the city of Mission and through underground passages to get to the clan stronghold while avoiding rival vampire clans and hired assassins. How they manage to take a week to get across New Jersey I have no idea, but I enjoyed the journey. I liked Tendra (except for her name, which bugs me) and the fact that she could hold her own in a fight with a vampire. But I wanted to learn more about her ancestors and their connection to the vampires and the prophesy. There's a scene where Tendra learns about her many-great grandmother's journal and I would have liked to see her read it. I also want more of Athan's family history, though I can't get too specific without spoilers. Megan Erickson's vampire mythos is unusual, though there's little I haven't seen before. The vampires are born as humans or dhampirs and can choose to be changed when they reach adulthood. That part, as well as the supernatural politics - one side that wants to remain hidden and one that wants to subjugate humans - remind me a little bit of the Last True Vampire series. What's a little different is the way the vampires feed by anesthetizing the humans with a gland in their wrists. This is my first book by Erickson, who I'm more familiar with as a contemporary romance author. While it didn't blow me away, I'm interested enough to read the next Mission book and I may even check out her shifter series.